12—GEAR Production Supplement F E A T U R E E very gear manufacturing company welcomes growth, but it comes with challenges. They include investing in new equipment to meet capacity, hiring skilled operators if necessary and even finding space to locate the machine. 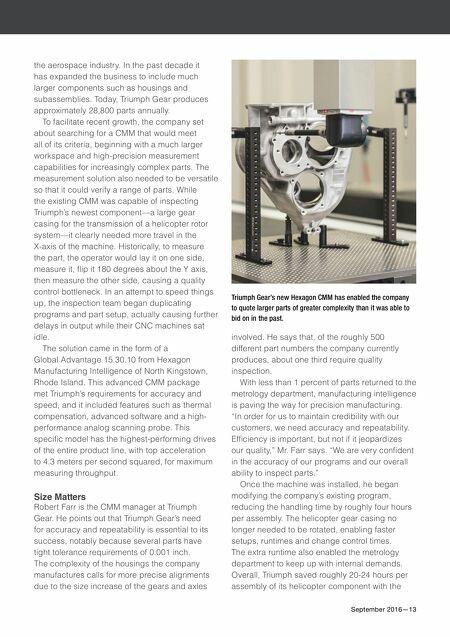 For Triumph Gear Systems-Macomb, these challenges were easily overcome when it needed a bigger coordinate measuring machine (CMM) to handle the larger parts it was beginning to make. The increased revenue from the new work justified the investment, the PC-DMIS software was user friendly for beginners and popular enough for there to be plenty of programmers available on the market. 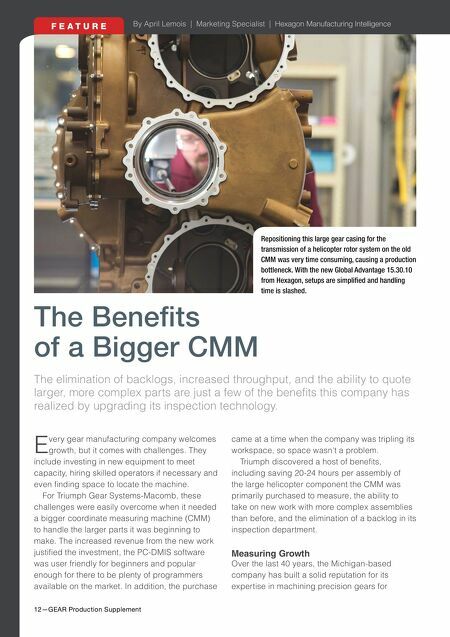 In addition, the purchase The Benefits of a Bigger CMM The elimination of backlogs, increased throughput, and the ability to quote larger, more complex parts are just a few of the benefits this company has realized by upgrading its inspection technology. came at a time when the company was tripling its workspace, so space wasn't a problem. Triumph discovered a host of benefits, including saving 20-24 hours per assembly of the large helicopter component the CMM was primarily purchased to measure, the ability to take on new work with more complex assemblies than before, and the elimination of a backlog in its inspection department. Measuring Growth Over the last 40 years, the Michigan-based company has built a solid reputation for its expertise in machining precision gears for Repositioning this large gear casing for the transmission of a helicopter rotor system on the old CMM was very time consuming, causing a production bottleneck. With the new Global Advantage 15.30.10 from Hexagon, setups are simplified and handling time is slashed.